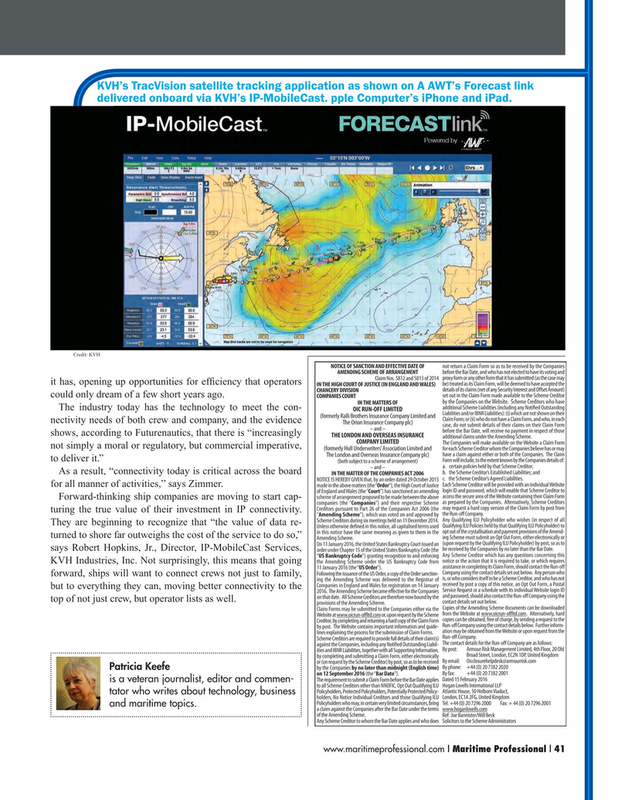 KVH’s TracVision satellite tracking application as shown on A AWT’s Forecast link delivered onboard via KVH’s IP-MobileCast. pple Computer’s iPhone and iPad. Credit: KVH it has, opening up opportunities for ef? ciency that operators could only dream of a few short years ago. As a result, “connectivity today is critical across the board for all manner of activities,’’ says Zimmer. Forward-thinking ship companies are moving to start cap- turing the true value of their investment in IP connectivity. KVH Industries, Inc. Not surprisingly, this means that going forward, ships will want to connect crews not just to family, but to everything they can, moving better connectivity to the top of not just crew, but operator lists as well.